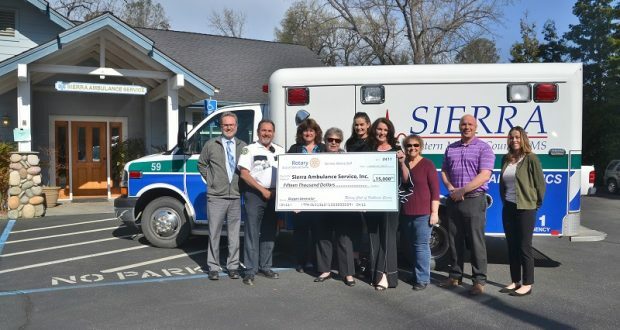 OAKHURST – The Oakhurst Sierra Rotary — also known as the Noon Rotary — presented a “giant” check this week to Sierra Ambulance Service. The $15,000 donation will help Sierra Ambulance purchase a new oxygen generator, according to Ed Guzman, general manager. 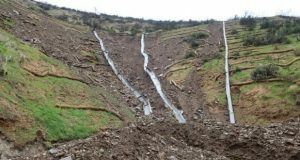 Guzman said Thursday’s contribution from the Rotary Club “represents a big part of our fundraising effort” in acquiring the new generator, which costs about $80,000. “With this check, we’re a little more than half way there,” Guzman said. 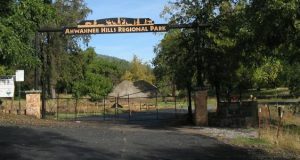 A $25,000 grant from the Chukchansi tribe, awarded in 2017, also will go toward the purchase of the new generator, Guzman said. Rotary’s $15,000 donation was raised at a fundraiser held March 24. The sold-out 13th Evening at The Elderberry House featured a dinner prepared by Chef Robert Snyder and drew 94 attendees, who paid $125 each to support at the cause. Carina Stephens, manager at the restaurant, said the staff volunteered their time to work the fundraiser. 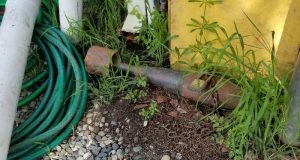 Guzman described the new oxygen generator as “a giant compressor with two large tanks” and said it will be installed at Sierra Ambulance’s Oakhurst headquarters. Though the public may be most familiar with the sight of ambulances at motor vehicle accidents, Guzman says that’s a very small part of what they do. 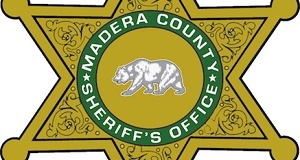 In the event of a local emergency, he added, members of the general public who rely on oxygen and have been evacuated with nothing but their emergency supply will be able to have their oxygen tanks refilled at Sierra Ambulance. Guzman says they will continue their fundraising for the generator over the coming months, and that one additional source of funding is membership fees. For just $65 per year, your family is covered for one transport annually to an area acute care hospital in Madera, Fresno or Mariposa County, with no additional, out-of-pocket expenses. The membership covers you and the immediate family residing in your household for the portion of the cost of the ambulance bill which is not covered by your insurance, or the bill in its entirety if you are uninsured or the claim is denied by your carrier. Becoming a member of Sierra Ambulance Service is easy and can be done online or by phone at 559-475-9821 or 559-642-0650. (Photo: Rotary President Dan Rule, Sierra Ambulance General Manager Ed Guzman, Sheri Lee, Fern Facchino, Carina Stephens, Christy Smith, Carole Blandy, Travis Trettin and Bobbie Duncanson).